Our Acsellerator solution helps foodservice distributors and their participating trading partners break down the barriers to customers deals, promotions, and often needed additional resources for independent and small chains with deal/promotional management software. Users’ selection of and approval of roles, permissions, and affiliates of is the “Connective Glue” for the network activity. More distribution control with more effective supplier and broker support of our promotional programs and resources. Transparency, collaboration, user automated deal routing, current deal history thru acceptance leads to more strategic data. Network access to promotional resources and decision makers. Simplifying the Promotions Sales Experience for All Trading Partners Providing Convenience and Speed Online for Independents and Small Chains Deliverables. Gain a frictionless solution for managing small chain and independent restaurant promotions. Partner more effectively with distributors to reach more customers. Successfully manage distributor and supplier resources to serve more customers. Create a better sales experience for customers resulting in customer loyalty and repeat business. We serve foodservice distributors, suppliers, and brokers to bridge the gaps in deal/promotional management to better serve the Independents and Small Chains. 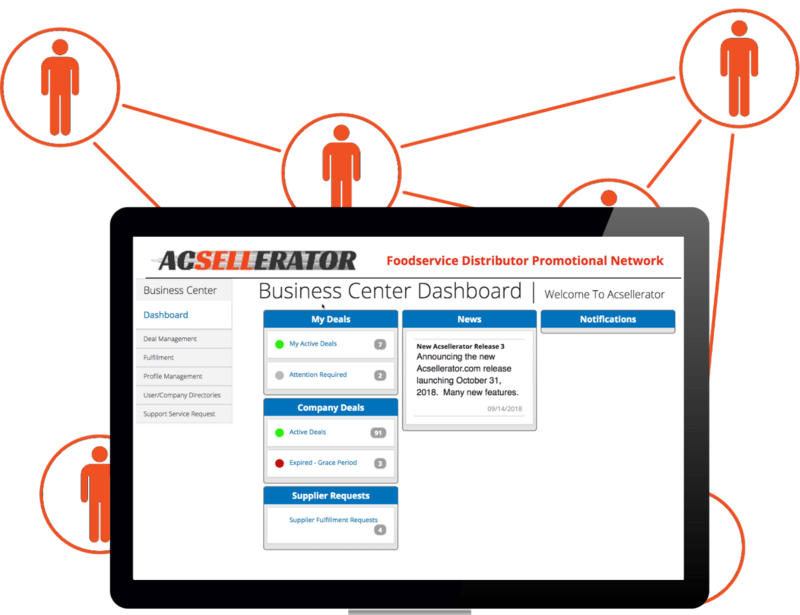 Acsellerator helps foodservice distributors manage trade promotion management through strategy, software, implementation, execution, and analytics. Acsellerator can facilitate distributors to take a more enthused sales approach to targeting independent and small chains. With access to request suppliers’ key resources, Acsellerator streamlines the sales deal management process including incremental data gathering. This, in turn, provides better reporting/analytics for marketing’s innovated promotional vehicles and measure decision-making of customer choices more accurately.